We have a lot to lose in Ashland when it comes to wildfires. Weed Abatement is required throughout the fire season or any other time of year when deemed a fire, health, or traffic hazard. WHY IS WEED ABATEMENT IMPORTANT? Grass fires and wildfires are ignited every year in and around Ashland, by people or by lightning. And whether it’s private property, community infrastructure or our watershed, we have a lot to lose when it comes to wildfires. Cutting grass and weeds reduces the ability for fire to start or spread as quickly, thus substantially decreasing the fire risk in our community. Tall, dead grass ignites easily and spreads wildfire quickly. 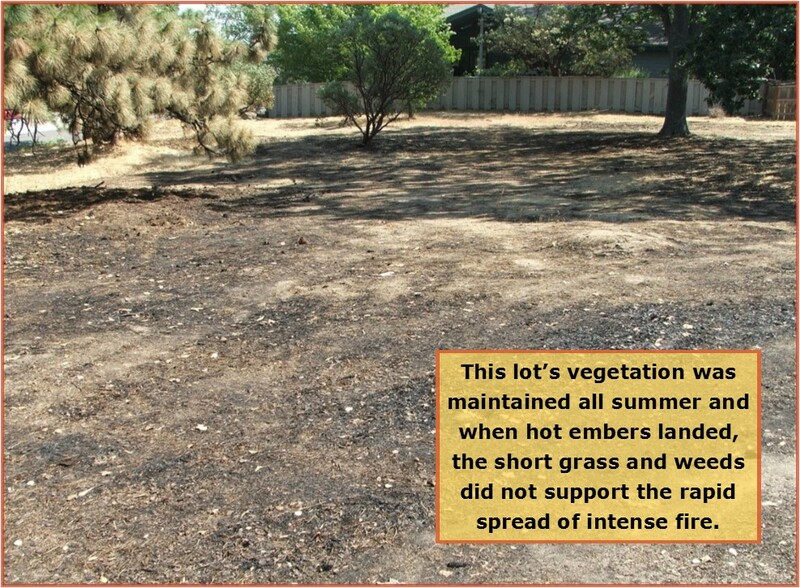 By following weed abatement requirements, you will make a significant difference in how a wildfire could spread on your property and throughout Ashland. 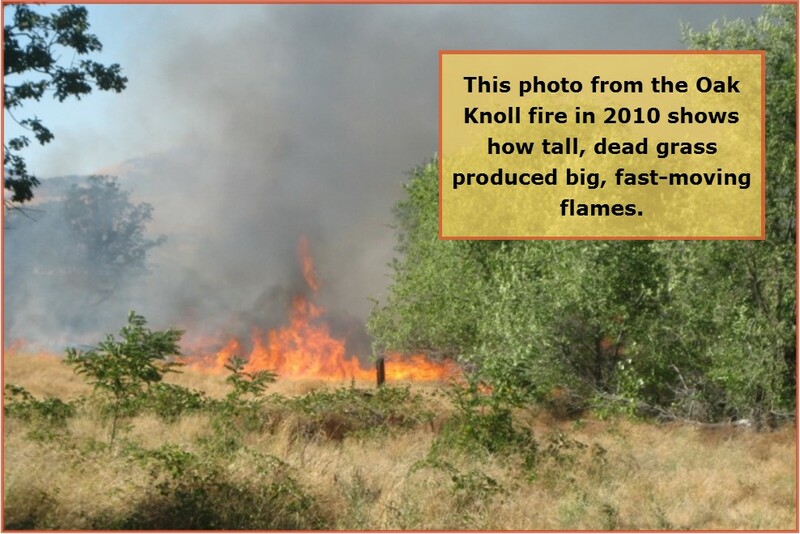 This photo from 2010’s Oak Knoll fire is from an empty lot where the grass and weeds had been cut short throughout the summer. When hot embers from just a few hundred feet away landed on the short vegetation, the grass and weeds ignited, but did not support the rapid spread of intense fire. In fact, this open lot provided a safe working space that firefighters used to help extinguish the fire. 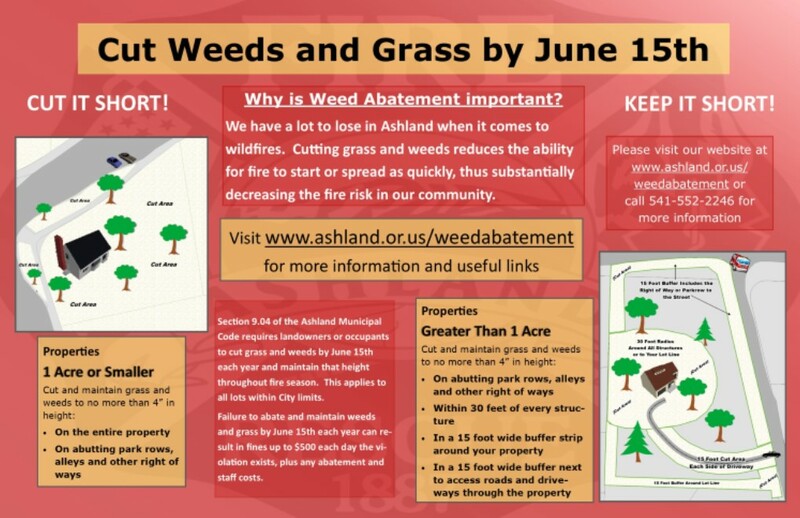 Ashland Municipal Code (Section 9.04) requires landowners or occupants to cut grass and weeds by June 15th each year and maintain that height throughout fire season. This applies to all lots within the City limits. Compliance with the weed abatement ordinance will substantially improve the overall fire safety in our community as well as reduce habitat for vermin and reduce the spread of noxious weeds. Click for a Printable 2 page Flyer! Click for a Printable Poster! To file a weed abatement complaint after June 15th, please use one of our forms using the buttons below. Please Note: To better facilitate the use of staff time, complaints will only be accepted using these forms beginning June 16th.